Tell us about your website and blog. 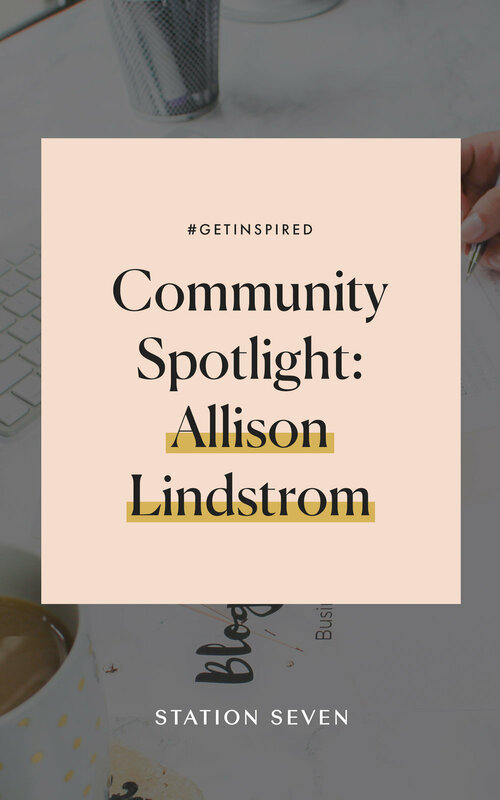 AllisonLindstrom.com is for women who are curious about what it takes to build a profitable blog and how to get started. I have no-nonsense tips and tutorials to really help shed some light on the confusing journey of making money blogging. I worked for a couple of years running my own freelance writing and Virtual Assistant business and, while I loved it, it was really draining. In an attempt to find more passive income, I started the Frugal on the Prairie blog. I was so thrilled once I started making a full-time income from it but I still really missed the entrepreneurial topic since it was what my whole freelance business had been built on! I eventually found a way to combine my two favorite worlds (blogging + entrepreneurship) by creating AllisonLindstrom.com. I took my experience from marketing, content creation, and making money from home to create a website that could help other women just like me. It’s a dream come true and I’m so thankful that this is my job! Successfully finding the balance between my blogging life and my personal life. Anyone who works from home can tell you how hard it is to “turn off” your business mindset because your office is literally in your house. Blogging, in particular, has a black hole of to-do lists so I find it helpful to be very conscious of my actions each day of the week. When I start to feel my business is being neglected, I remind myself that it’s okay to find “me time” to work on the blog. Alternatively, when I feel like the blog is taking over my life, I remind myself that I started blogging so I could be more present with my family. What’s the point of being my own boss if I’m missing soccer games or the first day of school? I definitely felt a sigh of relief just this past year when my family and I moved into our new home. We made the move happen without professional movers, so I essentially took off an entire month to pack, move, and unpack all of our (let’s be honest) junk. Ha! I was certain my income would suffer that month but I had created such a rock solid automation system for generating passive income (ad revenue, affiliate income, product sales, etc.). Not only did I make a full-time income that month despite taking off so much time from work, but it turned out to be my best month that quarter. Being able to contribute financially to my family while still taking care of them is by far my biggest win! I had no help and I have the scars to prove it! Building a website from scratch is undoubtedly the number one reason so many of my readers get frustrated with blogging. This is why I encourage them to place the task of design into someone else’s hands, like the incredible team at Station Seven. There are so.many.things you’ll have to do when setting up your blog that it can be a huge relief to not have to worry about the design aspect. Your blog should be more than just a fun hobby so think like a businesswoman from Day 1! Zero in on the niche you want to write in and think of the questions/problems people have in that niche. Then create content that makes their lives easier by helping them resolve an issue. If you can’t decide what niche you want to be in, make a list of 3-5 of your top choices and start writing! The best way to narrow down your niche is to actually get a feel for what it’s like to write about particular categories. Lastly, where can we find you on social media? I’m pretty addicted to Instagram Stories right now so you’ll find me on Instagram quite a bit! You can also find me on my Facebook Page.